It’s been a while since I’ve posted a healthy & hearty recipe here on Life Made Simple. Today I’m changing that! Now that our little one is venturing into “real” foods, I’ve started trying out new recipes that he can enjoy too. Last week I made some really yummy whole wheat banana pancakes that he LOVED and this week it was these whole wheat bran muffins. So why are these the best whole wheat bran muffins?! Because they taste amazing and they’re good for you too! These golden beauties are filled with bran, whole wheat flour, low-fat “buttermilk,” greek yogurt, coconut oil and fresh fruit. Oh, and did I mention they’re low in sugar? Yep, they’re the whole package. To start, you’re going to want to get a small mixing bowl or a 2 c. glass measuring cup to mix the wet ingredients in. You’ll need 1 c. of buttermilk, however, to keep these on the lighter side I opted to make my own by combining 1 c. of 1% milk with 1 tbsp. of lemon juice and allowed it to sit for 5 minutes. Along with the buttermilk, add the yogurt (Greek works great and adds extra protein), egg, oil (I used coconut), brown sugar (for moisture, flavor and sweetness), and vanilla extract. Whew. Now once you’ve combined those and mixed them up, it’s time to whisk together the dry ingredients in a larger mixing bowl. That includes the wheat bran (I used Bob’s Red Mill), flour (I used all whole wheat), baking powder, baking soda, salt and cinnamon. Pour the wet ingredients into the bowl with the dry ingredients, mix it up and then fold in any fresh fruit, dried fruit or nuts you’d like. I added blueberries, raspberries and coconut. Yum! Once the you’ve got the batter mixed up (don’t worry if it’s thick and lumpy, it should be) all you need to do is bake these babies! Pop them into a 425 degree oven (yes, it’s really that hot… it’s what gives these muffins their golden crunchy exteriors) for 14-16 minutes. Let ’em cool for a few minutes and then enjoy! Next time you’re looking for a healthy, easy and delicious muffin recipe, I hope you’ll give this one a try! We loved them and I know you will too! The Best Whole Wheat Bran Muffins Author: Natalie Prep time: 5 mins Cook time: 15 mins Total time: 20 mins Serves: 12 muffins Bran has never tested better! 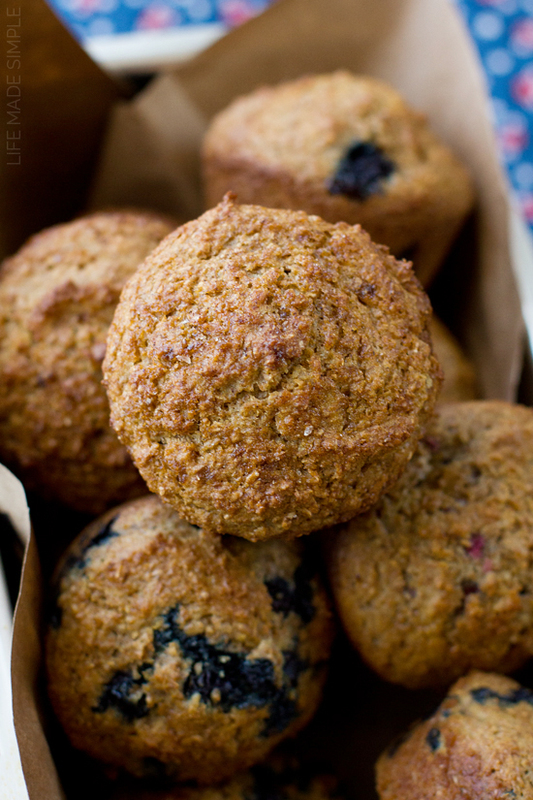 These are the best whole wheat bran muffins out there! Not only are they low in fat, but they're low in sugar too. A hearty & nutritious way to start your day! In a small glass measuring cup or bowl, whisk together the "buttermilk", yogurt, egg, oil, brown sugar, and vanilla. In a separate mixing bowl whisk together the bran, flour, baking powder, baking soda, salt and cinnamon. Gradually pour in the wet ingredients into the bowl of dry ingredients, mixing just until combined. Gently fold in the berries, dried fruit or nuts. *I opted for making my own "low-fat buttermilk" by adding 1 tbsp. of lemon juice to 1 c. of 1% milk and allowed it to sit for 5 minutes before using it. 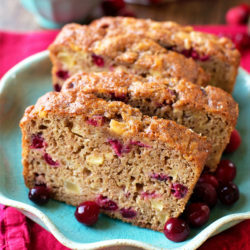 **If you like your muffins on the sweeter side, add an additional 1 tbsp. of brown sugar. ***You can use only whole-wheat flour, only all-purpose flour, or a ½ c. whole-wheat flour + ½ c. all-purpose flour. They taste great no matter what you use! 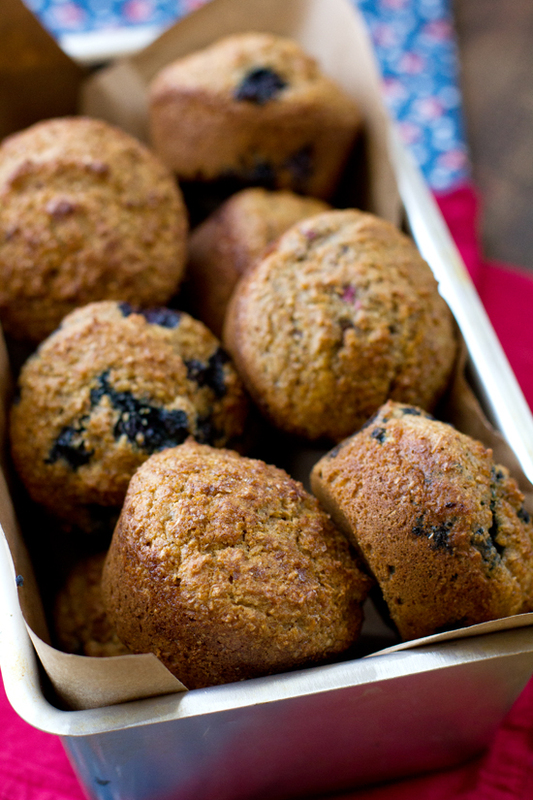 -Any fresh fruit is a great addition to these muffins! We've used raspberries, blueberries, apples and peaches. We also like adding in coconut and chopped pecans. i can never pass up a good bran muffin! 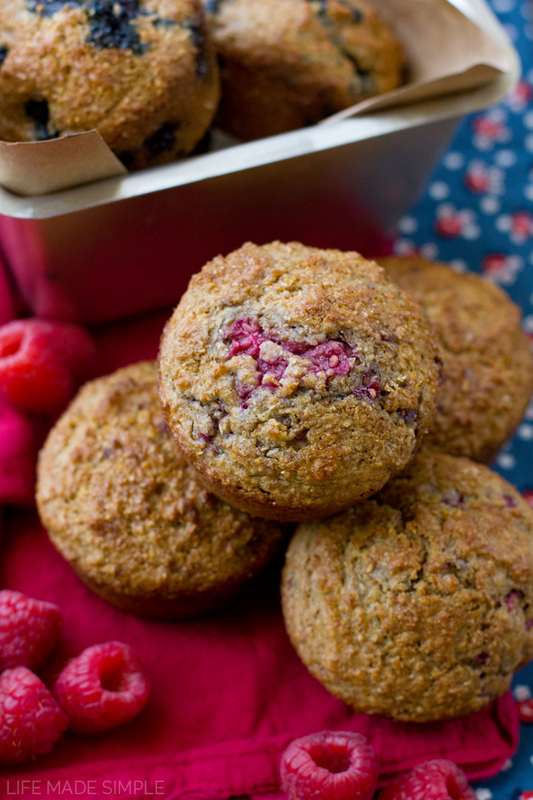 love how relatively guilt-free these muffins are.. thanks for sharing an awesome recipe! I made these for my fiance because we are both dedicated to changing our eating habits and live a healthier lifestyle. I substituted oat bran (it’s what I had on hand) for wheat bran and they were absolutely delicious. He liked them so much I’m sure to make them again. Thank you for a wonderful recipe. Could I substitute the milk/lemon juice “buttermilk” for almond milk and lemon juice? Or would it not work out? I’ve never tried that with almond milk, but I don’t see why not! Can you tell me what the calorie count would be? Loved the muffins. So happy to find a low sugar low fat recipe that tastes delicious. I added a little stevia to mine along with apples pecans and dried cranberries. Simply delicious???? These are delicious and only 141 calories each!!! At what temperature and for how long if I wanted to bake jumbo bran muffins using your AMAZING bran muffin recipe? Hi Lisa, I can’t really say. I haven’t made these any bigger. I would guess 8-10 minutes at the same temperature. Please let me know how they turn out! I made jumbo muffins! Reduced the heat to 499 and baked for 20 minutes. They were awesome!!! I really enjoyed this recipe. I didn’t have Greek yogurt at the time so I used regular vanilla and cut back a bit on the coconut oil. My brown sugar was also super hard and I couldn’t use it so I decided to substitute with coconut sugar. I also used 1 cup strawberries and 1/4 cup of chocolate chips, because of this combo I didn’t add cinnamon. An important note regarding mixing the wet ingredients: MAKE SURE THEY ARE AT ROOM TEMPERATURE. This wouldn’t be such a big deal using vegetable oil… however I used coconut oil and it turned solid once I mixed in the egg, yogurt and homemade buttermilk. I had to microwave the mixture on/off while stirring to melt my coconut oil again. Good thing it has a low melting point, otherwise I’m sure cooking this before baking could ruin the muffins. The ultimate result: I would definitely make these again! Baked 12 muffins to perfection in 15 minutes! These were fantastic. My whole family loved them. Next time I’ll have to double the recipe so we have some left over for the next day! Love these muffins! I make milk kefir so I use that in place of the buttermilk and soak the wheat bran in the kefir/buttermilk to soften up while I combine the remaining ingredients. Thanks for sharing the recipe. Sounds amazing- thanks for sharing Cindy! Can I leave out the Greek yoghurt? I don’t have any at hand so wondering if this would make a difference. I want to make strawberry and banana muffins. Plan on using 2 small ripe mashed bananas and a quantity of chopped fresh strawberries (not sure how much yet). Is there anything to be aware of with these fruits especially since they will be adding more moisture (eg longer baking time, more dry ingredients etc). Also I am using a regular (not fan) oven. Would the temperature be set at 220° Celcius? Hi CK, I can’t really say because I haven’t made those substitutions for this recipe before. As far as the baking temp, it would be 220 degrees. 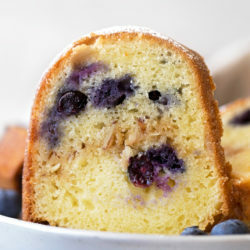 Hi, I want to try this recipe can I use frozen blueberries? These were awesome!!! Will be a staple for me going forward. 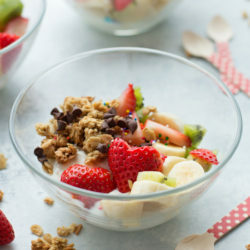 I used vanilla yogurt because it’s what I had and it definitely gave great flavor. Tried your buttermilk recommendation and it worked out perfectly! Enjoyed by my toddler and myself today, right out of the oven! I quadrupled the recipe too and all went well! These are wonderful! I reduced heat to 400 and baked for 20 minutes to make 6 jumbo muffins. Moist and tasty! Next time I’ll add more sugar since I prefer a sweeter muffin 😊. Great recipe! I will be making these regularly! Actually, the more I eat these, the more I appreciate the cinnamon and bran flavor! I think this muffin has changed my mind and now I don’t feel the desire for a super sweet confection. It’s perfect! Next time I make them I will add more dried fruit. We ate them with homemade strawberry/rhubarb jam. Delicious! These muffins were ok but I probably wouldn’t make them again. 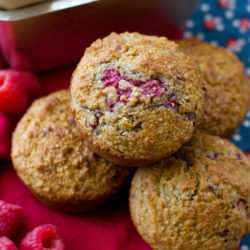 I love bran muffins but prefer the recipe from Canadian living for raspberry bran muffins. Hi Alex, I haven’t personally tried subbing the brown sugar for honey so I can’t really say. It’s worth a try! Also I was wondering if these can be frozen? So so good. Thank you! I did cut the coconut oil into the batter to make the oil chunks small and spread out. Not sure what would have happened with a big cold chunk otherwise. I just happened to google bran muffins and your recipe came up. I’m sure glad it did!! These muffins are so nice and light and delicious – just the right amount of sweetness for my taste (which is not too sweet). Thank you so much and will definitely make again!! Is the batter supposed to come out super thick? Hi there, simple, but tasty muffins! With lemon juice added to whole milk (as buttermilk), instead of yogurt, I used 1/2 c. ***vanilla “ensure plus”, omitted the brown sugar, as wheat bran I subbed bran flakes, used 1/2 c. chopped apples + 1/2 c. raisins folded in lastly. All else as recipe says, makes 16 medium muffins – 14 min. in 425° oven. Delicious! Serve warm with butter and homemade jam. *** ensure + is sweet enough, therefore no sugar added. Delicious!! and not so sweet!! Hi, I am wondering what the sugar amount per muffin is. thank you! Hey Natalie, I gotta say your bran muffins are awesome. I was looking for recipes using bran because I have a lot of it. We mill our own flour and sometimes sift out the bran for some of the breads we make. I never made bran muffins before because all the ones I have had in the past were course and pretty much tasteless. Your recipe is a game changer. I added fresh blueberries,craisins and pecans. Also used coconut palm sugar instead of brown (lower glycemic index). Just pulled them out of the oven and ate two of them in five minutes 😍. Mmm So good,moist tender and flavorful. Thanks for sharing the recipe. Thank you Diane for your kind comment! I’m so glad you liked them! I threw in some pineapple tidbits for something different and it was really good.